Admissions, orientation, assessment, counseling, financial aid, and the cashier’s office will be available at all four campuses to provide personal assistance with Spring admissions and enrollment. 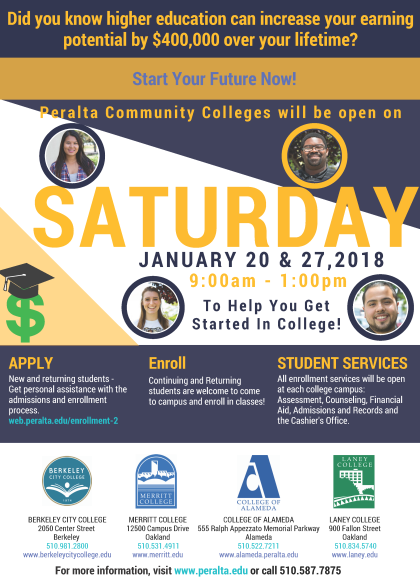 In order to complete all of the necessary steps within a Super Saturday, it is recommended that you review the Application & Enrollment Steps webpage and complete the OpenCCC/CCCApply online application (Step 1) at least 24 hours before attending. This way your Student ID will be ready and you can get started on the next steps upon arrival! Please arrive early in the day if you would like assistance with the online application (Step 1). You will need an email address (gmail and yahoo are popular services), accurate date of birth, dates of previous high school/college enrollment, and social security number (required only if applying for financial aid) to apply. Bring a valid ID (Driver’s license, passport, state-issued ID, student ID card) and any high school (within 10 years) or college transcripts you would like to be used for placement or development of your educational plan with your counselor. Unofficial or official transcripts are both accepted, however, official transcripts are recommended so that they can be kept in our database. You may also bring assessment test results from another instution from within the last three years.